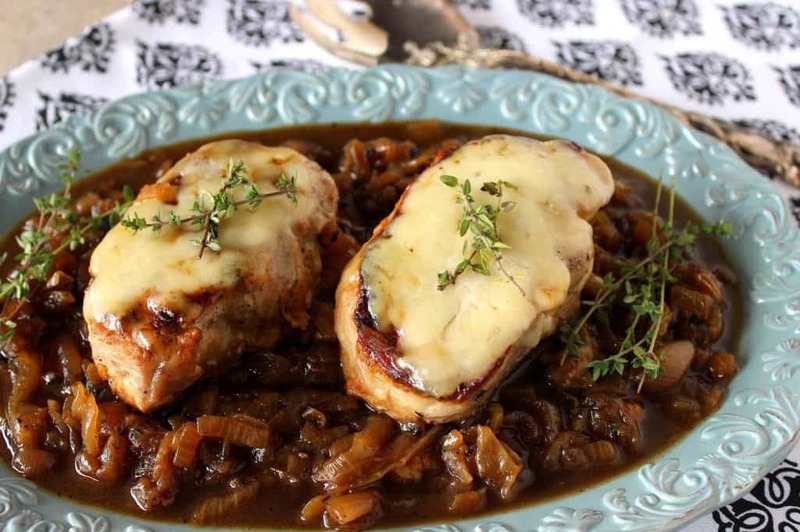 All the flavors you love in a traditional French onion soup are captured in this recipe for Boneless French Onion Pork Chops. 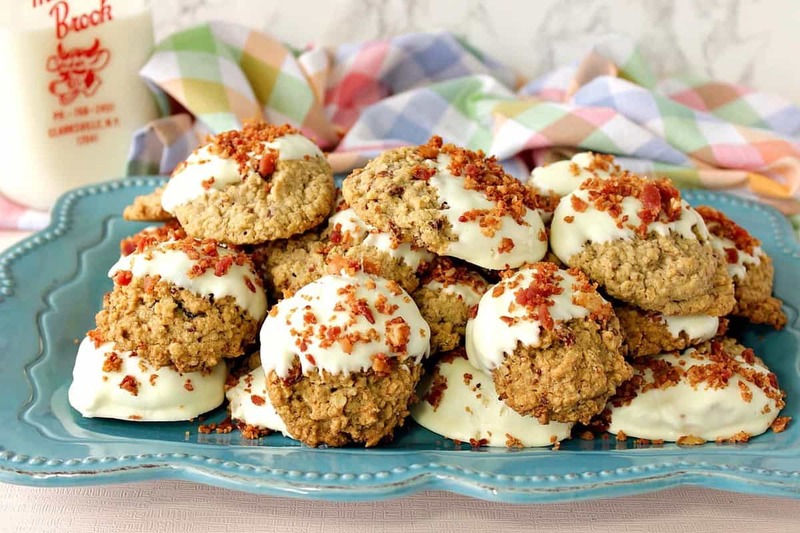 Plus, they’re low carb and delicious! Make some today! Boneless French Onion Pork Chops are my go-to meal when I’m craving a highly flavorful meal but without all the carbs. This recipe is one of the most popular on my site, and after you make them, you’ll understand why! 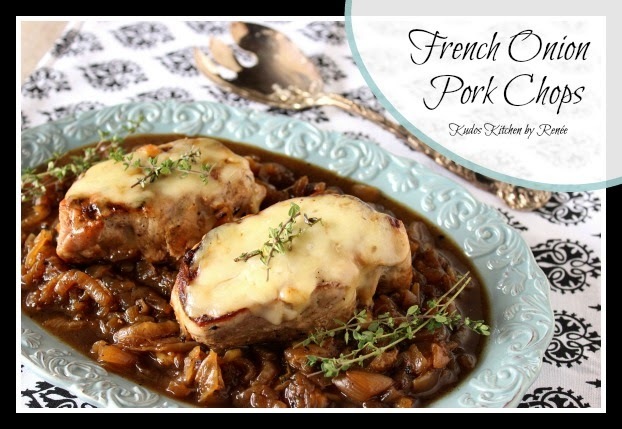 **Please Note – The printable recipe card with detailed instructions and complete ingredient measurements for making Boneless French Onion Pork Chops is available near the end of this post along with a quick paced video presentation. This recipe of French Onion Pork Chops is completely satisfying for any carnivore who is conscious of upping the protein in their diet. And also for any lover of French onion soup! I’m proud to say that since mid-December, I’ve lost a total of nine pounds. I’ve been very mindful of each and every item I’m putting into my mouth, and I’ve drastically cut back on my intake of white flour and white sugar products. Luckily for me, I’ve never had much of a sweet tooth so cutting back of sugary treats hasn’t really been a problem. However, the cutting back of white flour products like bread and bagels isn’t quite as easy. I do, however, love a hearty portion of protein with some ooey, gooey cheese. Enter, stage left, Boneless French Onion Pork Chops and take your much-deserved bow! What IS easy for me to do when rearranging my lifestyle in order to lose weight and get fit, is increase my protein intake. I tend to crave protein in all sorts of ways. Eggs are one of my favorite forms of protein as is turkey, chicken, and pork. Beef is nice too, but it’s not something I gravitate towards (unlike my husband who could live on beef for breakfast, lunch, and dinner). That said, whenever I make these French Onion Pork Chops for dinner, everyone comes running! Topped with a little bit of Swiss cheese (or feel free to use Gruyère), serve these French Onion Pork Chops along with a nice side salad and some Roasted Parsnips & Carrots with Cardamom & Maple Syrup. Or, if you’re feeling indulgent, how about over some mashed potatoes, pasta or even polenta or rice? Oh no! What have I done? Now my stomach is seriously growling at me! ACK! Here I am in my Kudos Kitchen walking you through the entire recipe. I hope you like this video and will subscribe to my Kudos Kitchen channel on YouTube. While you’re there don’t forget to click on the notification bell as I’ll be adding more and more cooking-show style videos going forward and I don’t want you to miss any! **The following affiliate links are some suggested products I’ve chosen that will aid you in the making and serving of this recipe for Boneless French Onion Pork Chops if desired. Below is the printable recipe card for today’s Boneless French Onion Pork Chops. 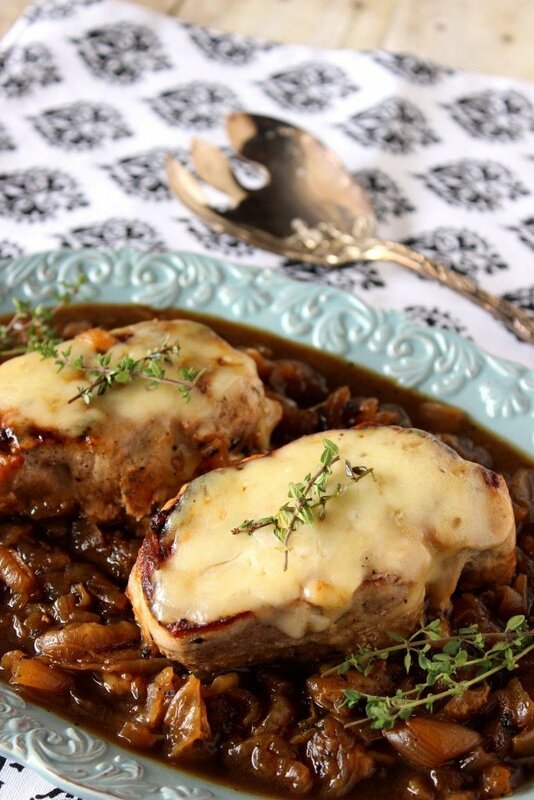 All the flavors you love in a traditional French onion soup are captured in this recipe for Boneless French Onion Pork Chops. Brush the Dijon mustard evenly on both sides of the pork chops. Season each chop, on both sides, with salt and pepper. Add 1 tablespoon of olive oil to a large skillet over medium/high heat and brown the chops on both sides, (approximately 2-3 minutes per side). Remove the browned chops to a plate and keep warm. In the same skillet add the remaining 1 tablespoon of olive oil, the butter, and the sliced onions, stirring well to coat the onions in the oil. Add 1 teaspoon salt and ½ teaspoon black pepper. Cook the onions, stirring only occasionally, until they're golden brown and caramelized. This should take at least 15 minutes over medium/high heat. Add the wine, stock, and fresh thyme to the onions, making sure to scrape up the browned bits from the bottom of the pan. Cook an additional 2-3 minutes after the addition of the wine and stock, stirring frequently. Reduce the heat to medium and add the chops back into the skillet along with the onions. Cover the skillet and cook for approximately 20-25 minutes, or until the chops are no longer pink in the center. Remove the cover and add the shredded cheese to the top of each chop. Return the cover to the skillet. Turn off the heat, and allow the cheese to melt. Garnish the top of each chop with a sprig or two of fresh thyme. Serve the chops on a bed of caramelized onions, making sure to remove the older thyme sprigs before serving. I sincerely hope you’ve enjoyed this recipe for Boneless French Onion Pork Chops as much as I’ve enjoyed bringing it to you! Should you have any questions or comments regarding this recipe for Boneless French Onion Pork Chops or anything else you’ve seen on my site, please don’t hesitate to contact me directly, or leave me a comment in the comment section below. It is always my distinct pleasure to get back to you with a reply just as soon as I possibly can! French Onion-all the things, please! I could bathe in this! Congrats on the weight loss – especially impressive because being a food blogger can be very hard on the waistline! This looks amazing – and if this is your "diet" food – I'm excited to start your diet plan! Those caramelized onions look perfect! Congrats on losing that weight! I would have the worst time with breads, also. Great recipe. How do you lose weight in December? That's impossible 😉 I wish I could say the same but unlike you, I have not been very mindful lately. While I'm not worried about my weight, I am starting to feel sluggish. This recipe looks fabulous, Renee! As always, I love your step by step guide, it makes it so easy to follow along! Congratulation, Renee! That is definitely something to celebrate! These pork chops look so flavorful and satisfying. I don't think I've ever had anything "French onion" besides soup or dip before. This is brilliant! making it soon! I'm so proud of you to lose weight during the holidays, Renee! Really, not easy to do any time of the year, but especially during festive times! Those French onions are calling my name! What a wonderful comfort dish! Congratulations on your weight loss!! I'm a sugar junkie. As such, my hips will always betray me and expand. I love this dish so much, Renee! I love French onion soup and there isn't a piece of pork I didn't like. This is my flavor station. I'm getting off. 9 pounds down…go you! These pork chops looks absolutely perfect. Love all those yummy caramelized onions. This is now my favorite pork chop recipe. I have made it twice and will be making it again soon! Served it over mashed cauliflower. Thank you for this delicious recipe!!! That means so much to me, Katie. Thank you for taking the time to let me know! I'm so happy you enjoy it! Con gradates on the weight loss. The recipe looks so yummy, going to make it to night. Thank you for this recipe. It is beyond delicious. I’m not sure how you did the prep in 25 minutes, especially caramelizing the onions, but I know I’m a “slow” cook. I used half the salt and it was perfect. I tend to use higher heat than I probably should. I’m glad you enjoyed the recipe and tailored the salt to your own preferences. Thanks for taking the time to visit, and comment, Linda! I tried this the other night and it was the most delicious pork chop I ever had in my life. Thank you SO much for posting this! I’ll be making these often! Hi Carol, I think provolone cheese would be an excellent choice! Go for it! Please click on that phrase and it will generate a printer friendly version of the recipe. Are you putting the pork chops onto a “dry” pan? You aren’t cooking them in any oil? I just want to make sure before I burn 4 pork chops! If you’re cooking the chops in the same skillet that you’ve cooked the onions then there should be enough residual oil and flavor to cook the chops. HOWEVER, if you’re worried about burning the chops, please feel free to add more oil before browning them. It won’t hurt the recipe at all and I promise, I won’t tell a soul. Absolutely delicious! The entire family loved this dinner and so easy to make!!! So happy to finally make a dinner that all will eat. Thank you!!! I’m so thrilled to hear this! Thanks a million for letting me know. It makes me so happy! I’ve answered your question in another comment box. Thanks for asking! Hi Cindy! Great question. Thanks for asking it. As a matter of fact you can easily finish this dish on the stovetop. All you need to do is cover the skillet and reduce the heat to a low simmer. Allow the chops to simmer until cooked through (approximately 15-20 minutes). Then cut the heat, remove the lid, add the cheese, replace the lid and allow the cheese to melt. Serve along with the caramelized onions. I hope this answers your question and that you enjoy this recipe! Hi there! So excited to try this recipe but really don’t want to spend money on buying an entire bottle of wine for just a little in this recipe. Can I just leave it out or is there a substitute? Thanks in advance! I totally get it, and this is a great question! It may seem like a weird substitution but if you leave out the wine, you can add 1-2 tablespoons of balsamic vinegar instead. With this adaptation, I know that you’ll still truly enjoy this recipe. Because the red wine adds a bit of acidity to cut through the richness of the pork, the vinegar will have the same effect and still add a depth of flavor that the red wine would have. I hope this makes sense. Again, great question. I’m so glad you asked and I appreciate that you came to visit me here in my Kudos Kitchen. This looks so delicious! I love pork chops! French Onion Soup is my all-time favorite wintertime comfort food. I have no doubt this recipe is gonna be well-loved in my house! You just made pork chops look SO AMAZING!!! I can’t wait to try this recipe! I wish I craved meat! All I want is carbs. 😉 And these are some awesome looking chops! Those pork chops look and sound absolutely terrific! Wow, so much flavor in this dish. These chops are over the top yummy. These look divine! I love the flavors! Wonderful!!!!! Thank you so much for sharing. It is my distinct pleasure, Lora! Thank you so much for your comment, and HUGS back to YOU! Hi. Beef has become so expensive, I am always looking for new recipes using pork. What cut of pork did you use for this? Is it boneless, center cut? How thick should the chops be? Thanks so much. Yes, I used a boneless pork chop and they were approximately 1″ thick, or slightly thicker. These days pork chops can get away with being a tiny bit pink in the center so they’re not overcooked, dry and tasteless. However, ground pork should always be cooked so no pink remains and the internal temperature reaches 160 degrees on a meat thermometer. Boneless pork chops take a shorter amount of cooking time, and bone-in take longer because of the bone. If it makes you more comfortable, make sure the center of your chops (boneless or bone-in) reaches an internal temperature of 155 degrees before removing them from the heat. They will continue cooking a little bit after they’ve been removed from the heat. I think your husband will love the chops. Hi. Beef has become so expensive, I have started cooking more pork. What cut of pork did you use and how thick were the chops? I am eager to try this recipe but want to be sure to do it right the first time around so that my husband likes it (hopefully) enough for it to become a keeper. I’ve answered you in another thread. will chops with bone in work? Yes, pork chops with the bone will work. You may need to cook them a little longer because of the bone IF they’re very thick. If they’re thinner pork chops with the bone, the cooking time will likely be the same. Nowadays pork is perfectly fine to consume if it’s a tad pinkish in color after cooking. I love french onion and pork chops, so this is my ideal meal! Love it! I guarantee it will become one of your favorite recipes! Thanks for visiting! My husband LOVES French onion soup so we were super excited to try this. It’s delicious and so easy! Yum! I’m so glad. This is one of our very favorite recipes, and it IS easy and IS super delicious. Enjoy!! I have made this recipe before with a slight variation. Instead of chicken stock and wine, I use a jar of pork or brown gravy. after simmering for one hour in the gravy after they’ve been seared. I appreciate your comment and the changes you’ve made to my recipe. However, since you’ve not followed the recipe (as written) I think it’s unfair that you’ve only given my recipe 3 stars. Perhaps had you tried the recipe as written you’d agree that it would be worth a 5-star rating. Have a wonderful day! I am so pleased that you enjoyed my comment and the changes I have offered. simmering the pork chops in the recipe’s directions. I know they need to simmer longer. Just thinking about making these has me drooling like a teething baby. SO GOOD, can’t wait to make them again! LOL. Glad you like them so much!! Thanks. This is totally my family’s kind of meal! I love the flavors and how easily this comes together! I’m so glad to hear that, Wilhelmina. Thank you! I enjoyed making this, it was fun but I ended up with a fairly dry chop so I’m not sure if the chop was too thick for the liquids suggested or if I did something wrong. I considered lowering the score to a 4 but my wife absolutely adored the dish as is so I might just be overly critical of my own cooking rather than there being a fault with the recipe itself. I suppose the only thing I can say is maybe cut the cooking time down just a little if you think the pork was too dry. Anyway, have a great day and happy cooking!! I made this dish along with the parsnips and carrots tonight for our Christmas eve meal and it was a hit! I will definitely make it again. That’s wonderful, Dawn! Thank you so much for letting me know. Delicious! There are also so many ways you can adapt this recipe. I chose a bed of polenta which worked very well. These pork chops are fabulous! Definitely making them again. Great to hear. Thanks, Tara!! I love a good pork chop recipe! This looks absolutely amazing, can’t wait to try it! Thanks, Nellie! I know you’ll be pleased. These were so yummy! I love french onion soup and pork chops, so this was the perfect pairing. Will definitely make again. I’m so glad you enjoyed these chops! They’re definitely a favorite with my family! Enjoy! We tried this recipe tonight and OMG was it delicious! Can’t wait to have it again! New Years resolution is to cook for myself more. Since I’m a 35 year old man (who ALWAYS eats out) I have to start with easy dishes. This is a super easy dish! I was worried about the simmer time with the pork, and how my sauce would turn out. Wow, was I amazed! This dish is outstanding!! Thanks a ton for sharing this recipe! Will make over and over again!! This is the best comment, EVER! Thanks so much for taking the time to let me know that you’ve enjoyed the recipe AND cooking at home! I’m sure you rocked it! Happy New Year! Is there anything that would be good to marinate the pork chops, perhaps the wine? I’m not much of a cook but I try to marinate everything I can. Also, I went with cooking wine instead of wine wine…that shouldn’t be a problem, right? If you wish you can brush the chops with a light touch of apple cider vinegar and allow them to “marinate” for 10 minutes. Dry the chops with a paper towel before continuing. The acid in the vinegar will help to tenderize the pork. I use vinegar often to tenderize proteins. However, because there is also an acidic component in the Dijon mustard, that ingredient works as a marinade (of sorts) for the chops, so additional marinating isn’t actually required. If you like, let the chops sit for 10-15 minutes after brushing with the mustard and then continue with the recipe. As far as the cooking wine. I always prefer cooking with a wine I would drink and not one specifically made for cooking. Cooking wines are usually bitter in taste so the results won’t be as good as if you were to use a drinking wine. However, if you’re in a pinch and have no other choice than to use the cooking wine, cut back on the amount just a little and also cut back on the salt called for in the recipe. I hope this helps. I’d love to hear how the recipe worked for you and what (if any) changes you’ve made to make it your own. I cut back the cooking wine like you suggested (but only a tiny bit) and let the chops sit with the Dijon while I got everything else together…except I had already sliced the onions. The rest I did my best to follow your recipe. It was great, I absolutely loved it! Also, for having very little real cooking experience, it was quite easy to prep and cook. That’s wonderful, Jared! I’m so pleased. Thank you for letting me know, and congratulations on cooking a great meal! Big hit with the whole family! That’s wonderful to hear, Tanya! Thank you so much for letting me know. I’m thrilled your entire family enjoyed it! Excited about trying this recipe! It appears to be right up my alley. My Dad has moved in with me and has dietary restrictions (a mile long, it seems on some days) and I happened upon this recipe in a search for something tasty but within limits. This looks like it will fit the bill! That makes me so happy, Theresa! I hope you and your dad both love it and will come back and let me know. I wish your dad the best of health. So even tho I burnt the heck out of the onions the pork chops were delicious thanks for the recipe! Sorry about the onions, but glad about the pork chops!! Thanks for the rating! I appreciate it!